How can I send follow up emails to customers? 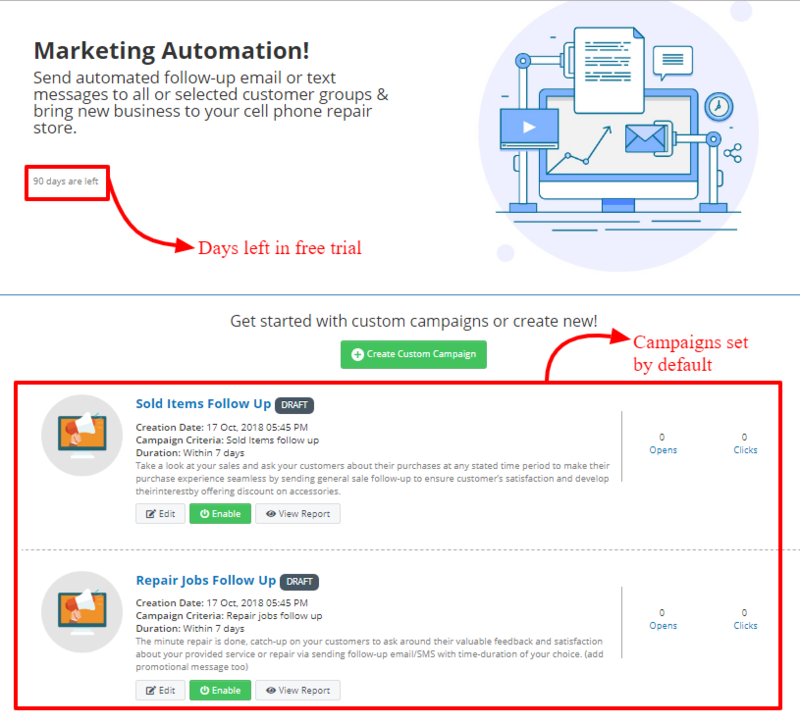 RepairDesk allows users to send follow up emails and SMS in the form of campaigns. These automated emails/SMS will be sent to customers, allowing you to automatically check up on them. RepairDesk's Campaigner Module will help you to follow up on customers, after their repair jobs have been completed. It's a great marketing tool, enabling you to boost your business by building meaningful relations with customers. How to Setup Follow Up Emails through Campaigner? 1. On the main screen click on Campaigner from top navigation menu. 2. By default, two campaigns are available, one to follow up on customers after 15 days and the other after 60 days. To create a custom campaign, click on the Custom Campaign button. 3. To modify a campaign, click on the Edit button. 4. To launch or discontinue a campaign, click on the Enable/ Disable toggle button. 5. 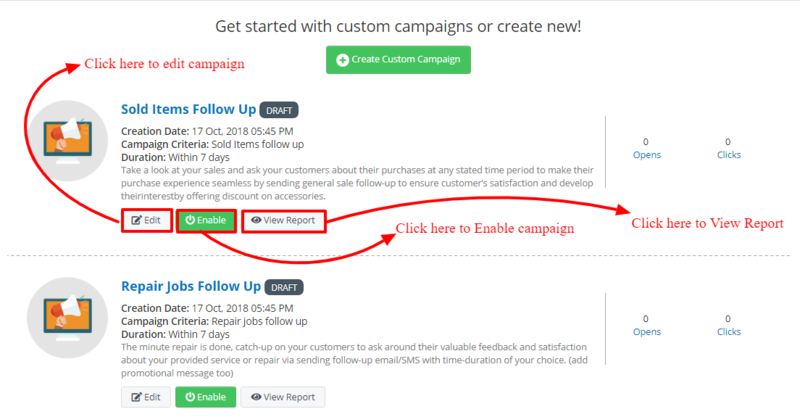 When you click on Custom Campaign button, you will be taken to the Create Follow Up Email screen. Enter Name, select Duration, write Subject line and email content. Finally click on Create button to save your setting and create a custom campaign. We have succesfully setup free trial for our updated Campaigner Module that allows you to set custom days for campaign and now you can run campaign against specific repair items and specific sold devices. By using this updated module, you will be able to get feedback from more customers and enhance your business operations accordingly. Moreover, you can track the efficiency of campaign by using our email/sms tracking feature offered in upgraded campaigner module. 1. Head to Campaigner section from POS Screen. 2. You will be directed to following screen from where you have to Hit Try for Three Months Free button to enable the free trial. 3. You will get the following screen displayed where it will show you how many days are left for your free trial and by default you will get two campaigns setup against sold items and repaired devices. Note: You can edit these campaigns using Edit button and use Enable button to enable/disable the campaign. To view report against a campaign, hit View Report button and it will show you the results of campaign in the form of a report. 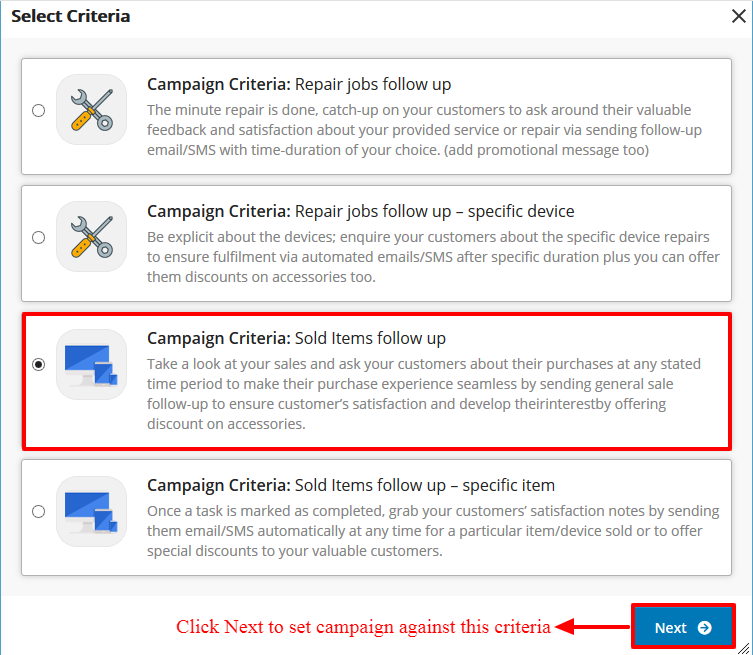 To create custom campaign, click on Create Custom Campaign button and it will direct you to screen with four campaign criteria. This criteria relates to sending follow up email/SMS to all customers who have visited the store for getting their device repaired. a. 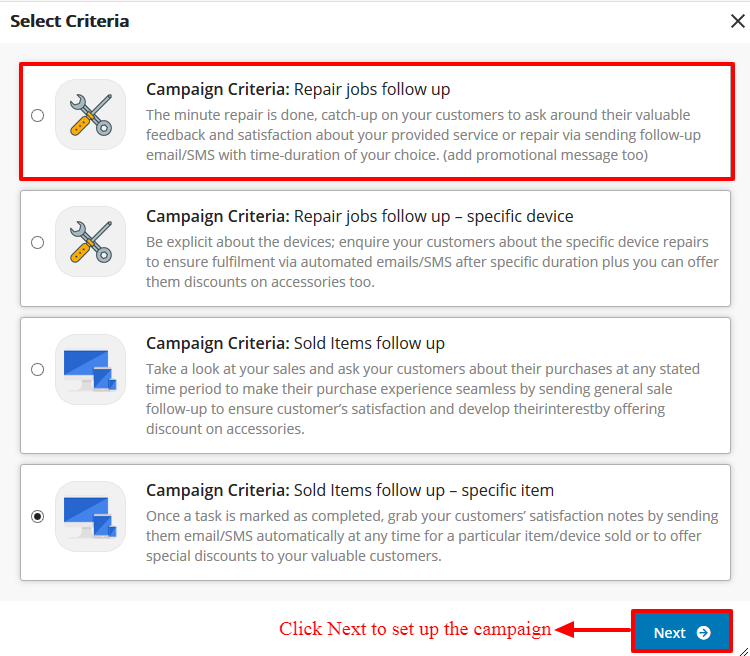 To set up this campaign, choose Campaign Criteria: Repair Jobs follow up from listed criteria options and hit Next button. b. You will get the following screen displayed where you can enter Campaign Title, Duration, Subject and choose campaign medium. c. By default we have provided you following email template that will be sent automatically on activating the campaign. 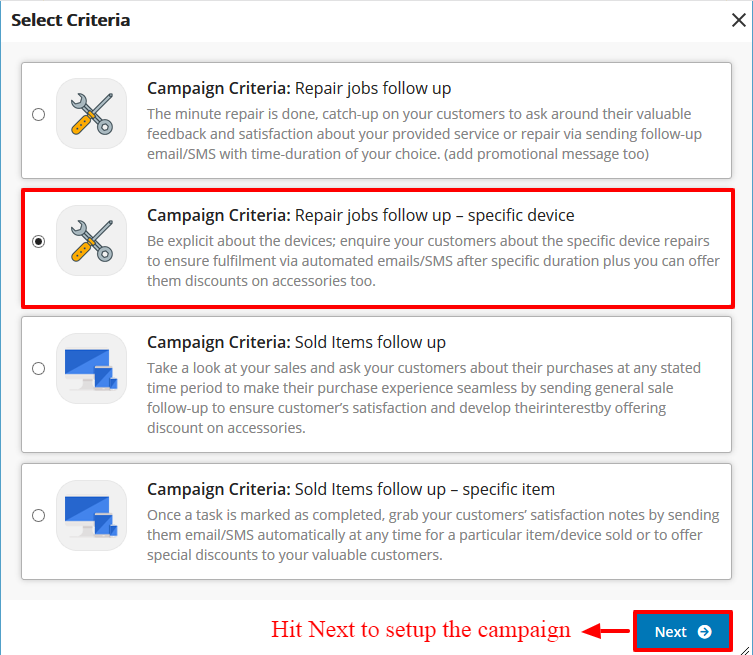 d. Once you hit save button, the campaign will be saved and everytime when you run the campaign, follow up SMS/Email will be sent to customers that have visited the store for repair during specified period. Note: To send SMS, you must make sure that SMS integration is enabled. By setting up this campaign, you can send follow up email/SMS to the customers filtered by device. To set up this campaign, please follow the step by step guide below. a. Select the option campaign criteria: repair jobs follow up-specific device from the available campaign options. b. You will be directed to the screen shown below where you can setup campaign title, duration, device, subject and follow up SMS/Email. c. By default you will have the following email template. d. Enter the SMS/Email content and hit Save button. Everytime when you run the campaign, the set content will be sent as follow up email or SMS depending upon your chosen options. By choosing this criteria, follow up email/SMS will be sent to customers who have purchased accessories during the defined period. To learn, how this criteria works, please follow the steps below. a. Select Sold Items Follow Up as campaign criteria and hit Next. b. Enter campaign title, duration, campaign subject and choose campaign medium. c. By default you will get the following email template. d. You can setup the email content and hit Save button to save the campaign. Your campaign is ready to run ! 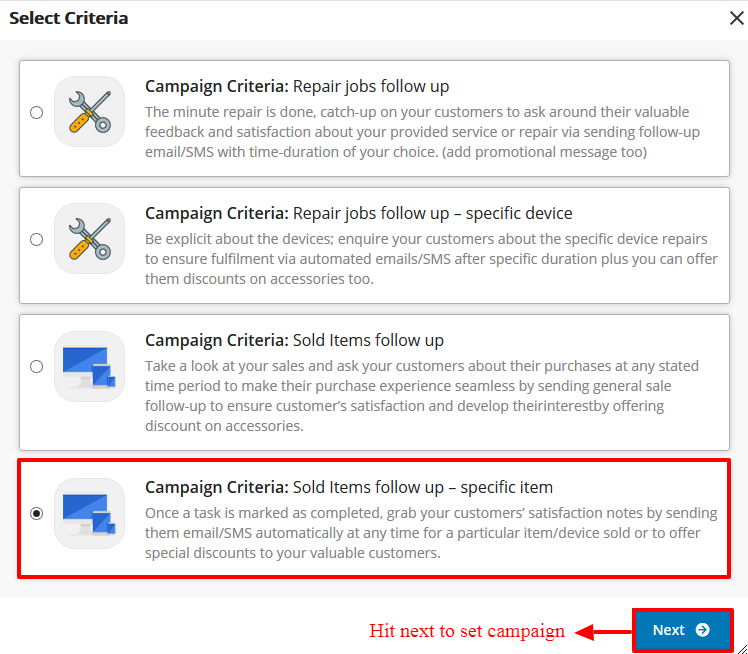 a.To set campaign against sale of some specific items,select the campaign criteria and hit next. b. Select campaign title, duration, items, subject and campaign medium. c. Following email template will be displayed by default which you can edit using FCK editor or template editor. d. You can enter SMS content here and hit Save to save campaign. To view report, click on view report option after creating the campaign. Date and Time at which the campaign was created. Click Rate: Ratio of links clicked (sent in an email) against the ratio of total links sent. For example if you have sent two emails and each of them have two links. Customer has clicked on only one link then click rate would be 25%. 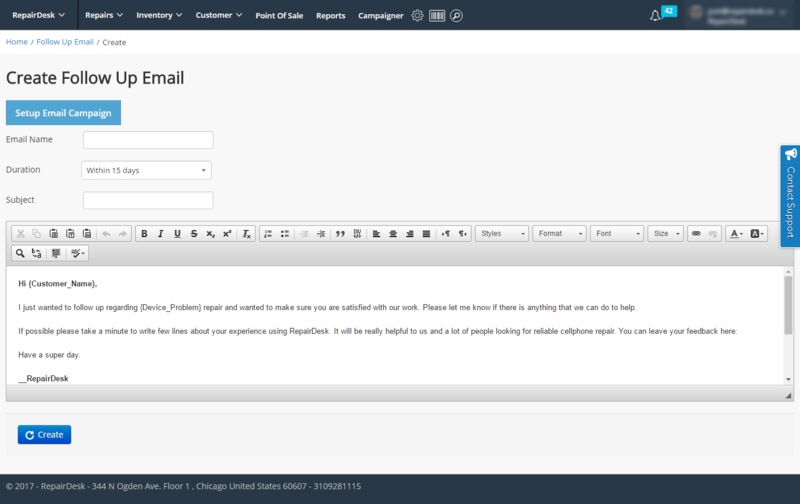 With our updated Campaign Module, you will have the facility to track the mail repsonses made by the customer. To do this, you can view open and clicks as shown below. By clicking this option, you will get the following report displayed. It shows the email address of customers alongwith opened email count, first name of customer, last name and date and time at which the email is opened last time. Similarly to view clicks against each URL sent in the email, you can track their status by clicking on Clicks as shown below. By clicking on this link, you will be directed to clicks report as shown below which will show you the total count of clicks made on each URL as well as unique clicks that each customer has made on URL. Q. Can I set custom days against campaign? A. Yes you can set custom days against a campaign by following the steps below. 1. Select Custom from list of available time duration. Q. Can I customize the email/SMS content? A. Yes definitely you can customize the email/SMS content using our template editor. You can just copy and paste the available macros from the list provided and put it in place where you want that parameter to appear in email/SMS content. Q. Can I select multiple campaign criteria at the same time? A. Yes you can select multiple campaign criteria at a time. Q. Is it possible to set campaign against multiple devices and sold items? A. Yes it is possible to select multiple devices and multiple sold items while setting up Sold Items Follow Up-Specific Items and Repair Jobs Follow Up-Specific Device campaign. Q. Whats the criteria for setting campaign against sold items? A. Campaign against sold items work only for customers who have fully paid their invoices. Q. Is it possible to test the camapign once its enabled? A. Yes definitely. Once you enable the campaign, it will give you an option to test campaign to make sure that email and SMS are sending against the test criteria and you can procced without any doubt. Q. Once I have enabled a campaign, will it work for all my stores? A. No, the updated campaigner module works store wise. You have to enable the required campaign against each store separately. How do I manage customers? How to Create Customer Groups and enable Third Party Billing? How to Import Multiple Customers in RepairDesk? How to Add Notes against Customers? Can I search any particular customer from the list? How can I edit customer details? How can I view all the order details of any customer?